Posted on March 22, 2013 by dan reed! The existing part of Montrose Parkway. Photo by thisisbossi on Flickr. After 40 years of planning, an extension of Montrose Parkway through White Flint could soon become a reality. County and state transportation officials say the highway is needed to move cars, but residents and county planners say it contradicts their goal of making White Flint an urban center. Work on Montrose Parkway began in the 1970’s, when it was planned as part of the Outer Beltway, which was eventually built as the Intercounty Connector. Later, a portion of the highway’s route between Veirs Mill Road and New Hampshire Avenue was turned into Matthew Henson State Park. 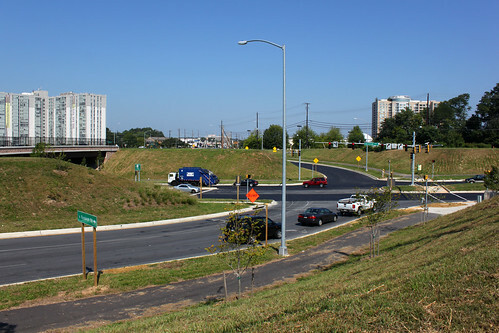 Planning for the current version of Montrose Parkway began in 1998 and resulted in the construction of the segment west of Rockville Pike, which opened in 2010. The Planning Board’s recommendations, which aren’t binding, will next go to the County Council for a vote. SHA officials say that construction won’t begin for at least 5 years. The proposed four-lane highway would have a stoplight at Chapman Avenue and overpasses at Nebel Street and the CSX railroad tracks. At Parklawn Drive, there would be a single-point urban interchange or SPUI (pronounced “spooey”), where drivers on Parklawn would stop at a light before turning onto the highway. A SPUI already exists at the junction of Falls Road and I-270. SHA and MCDOT representatives insist that Montrose Parkway is needed to handle anticipated traffic from the redevelopment of White Flint. “If you build more density, you’re going to have more traffic congestion,” said Edgar Gonzalez, MCDOT’s deputy director for transportation policy. However, recent studies and local examples suggest that compact, mixed-use development like what’s proposed here will actually reduce traffic, raising the question where MCDOT and SHA’s concerns are actually valid. Plan showing Montrose Parkway at Parklawn Drive if Randolph Road is open. Plan showing Montrose Parkway at Parklawn Drive if Randolph Road is closed. Since the latest plans for Montrose Parkway were first presented two weeks ago, residents have expressed concerns about the state’s plans to close Randolph Road, a major east-west thoroughfare running parallel to the parkway, where it crosses the railroad tracks. SHA officials say it’ll improve safety. The Federal Railroad Administration calls it the 4th most dangerous crossing in Maryland: there have been 21 collisions there in the past 35 years, including one death. Since 2007, there has been just one collision. Separating the road from the railroad tracks also means trains won’t have to blow their horns when they pass through, something many neighbors have complained about. Randolph Road would end in a cul-de-sac just east of the tracks, and anyone who wanted to go further west would have to get on Montrose Parkway. Chair Carrier worried that this would hurt access to shops along Randolph Road. “It would be hard to imagine that the businesses there would remain viable,” she said. Nonetheless, board members voted to keep Randolph Road open at the railroad crossing, which planning department staff recommended because it gives travelers more options, reducing the traffic burden on any one road. Plan of the entire eastern portion of Montrose Parkway. Much of the debate about Montrose Parkway revolved around the proposed interchange with Parklawn Drive. Board members worried it would become a barrier between White Flint and Twinbrook, making it difficult for people to walk or bike from one side to the other. In the past, county planners have recommended putting a stoplight there instead. Former planning director Rollin Stanley argued that interchanges in White Flint “[reinforce] the view that Rockville Pike is a runway to get through White Flint versus moving through the area as a destination itself.” Last fall, acting planning director Rose Krasnow wrote a letter asking MCDOT and SHA to consider it, but was rebuffed by MCDOT director Arthur Holmes, who said the interchange would “improve safety and reduce barriers by separating conflicting flows” of cars, pedestrians and bicyclists. Likewise, Gonzalez said that an at-grade intersection, which would require that Montrose Parkway be 9 or 10 lanes wide to handle projected traffic, which would be just as bad for pedestrians and bicyclists. Planner Larry Cole argued that it’s because the county and state’s plans are “overdesigned” and overestimate the amount of future car traffic in White Flint. “The reason [Montrose Parkway] is this big is that the space is available,” he said. 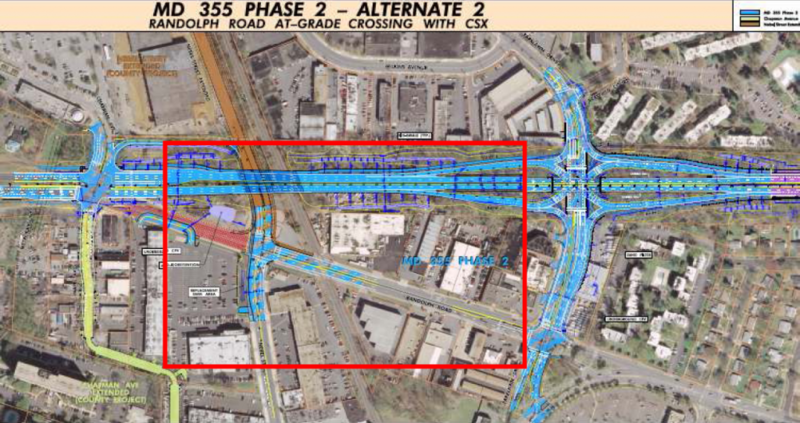 Nonetheless, the board eventually voted in favor of keeping the interchange after officials from MCDOT and SHA promised to look at ways to make crossing the interchange safer and more pleasant for pedestrians, such as restricting right turns on red. The parkway will already have a 10-foot path for bicyclists and pedestrians on the north side and a 5-foot sidewalk on the south side. Over time, the vision for White Flint has changed a lot. Forty years ago, the Outer Beltway was supposed to pass through it. 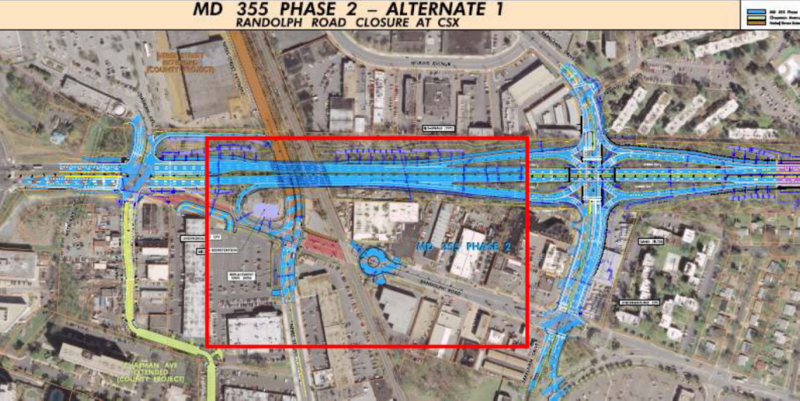 Twenty years ago, the Planning Board sought to build multiple interchanges along Rockville Pike. Even the White Flint and Twinbrook sector plans, which are less than 5 years old, included the Montrose Parkway. However, these neighborhoods are envisioned as urban places where people will be able to drive less, and to succeed it needs a street network where people feel comfortable and safe not driving, and Montrose Parkway as proposed could undermine that. The Montgomery County Department of Transportation and State Highway Administration work for pedestrians, bicyclists and transit users, not just drivers, and their plans for places like White Flint must reflect that. This entry was posted in Montgomery County Government, Transit and tagged MCDOT, montrose parkway, Rockville Pike, SHA, Smart Growth, transportation. Bookmark the permalink. I originally thought that the closure of Randolph Rd to cars at the CSX track would not be a big deal, as long as the crossing was still open to bike and pedestrian traffic. However, after driving this route from my home on Parklawn into the White Flint sector, I changed my mind. Not only would it destroy business on that stretch of Parklawn – or any hope of redeveloping them, it would also limit access to the new Nebel Street extension road and the original Nebel Street Road. If the new parkway bridges over Nebel street and I can’t get to Nebel from Randolph, I would have to go a mile or more out of my way to get to the locations along Nebel street from Parklawn or Randolph Road vicinity of Loehman’s Plaza and Randolph hills or confront many more traffic lights. I’m now thing this is a bad idea. How about instead tunneling under the CSX track, if safety is such a concern? Sorry, I meant the business along Randoph Road would suffer, as the article noted.